DNA testing became a widely available commercial phenomenon in the past decade. Scientists and genetics experts brought the concept closer to the general population and DNA testing caught on metaphorical fire, with millions of new users every year exploring their ancestry, performing relationship tests, and discovering more about their health – all through DNA. Our ultimate guide to the best DNA testing kits of 2019 can keep you up-to-date at all times by relaying the latest innovations and breakthroughs in the field. Our skilled team is constantly looking for new DNA testing options, making sure you don’t miss a single new test, a promising new company or available coupons. While comprising a list of the best DNA testing kits is pretty difficult due to the abundance of excellent providers on the market, we’ve managed to single out those tests we think are the best of the best. MyHeritage is a prominent provider of ancestry DNA testing and genealogical resources. The company, which was founded in Israel, follows the direct-to-customer DNA testing approach. AncestryDNA offers one of the best ancestry DNA tests with a solid genealogical backup. Its direct-to-customer testing kit allows you to collect your sample at home and simply wait for the results. 23andMe is widely considered as the pioneer of direct-to-customer DNA testing. It's also the only company that includes health-related results into your ancestry report for an additional fee. Wisdom Panel offers numerous DNA testing kits designed to help private dog owners learn more about their animal friends. The company also provides valuable tools for breeders and veterinarians. Living DNA offers the most region-specific ancestry DNA test with the most accurate ethnic estimates on the market. Living DNA testing kit is available exclusively on the official website. Embark is a dog DNA testing provider committed to discovering all the secrets hidden in the DNA of our animal friends. Adam and Ryan Boyko turned their love for dogs into reliable and convenient canine testing solutions. Join the BLACK FRIDAY FRENZY and get your $40 discount! TeloYears genetic testing kit allows you to determine the exact cellular age encoded in your DNA. The test was created by 2009 Nobel Prize laureate Dr. Elizabeth Blackburn. GPS Origins testing kit is a part of the most sophisticated genetic ancestry test available. The test was created by DDC, which is well-known for its meticulous processing and robotics technology. Save $50 on GPSOrigins! Use code GPSCJ50 on checkout. Futura Genetics designed a simple test kit to bring complex DNA testing closer to the general public. It aims to provide 100% accurate reports for many dangerous diseases and conditions. JScreen is a Jewish nonprofit organization featuring the best screening panel for more than 200 genetic diseases, 19 of which are almost exclusively found in people with Jewish heritage. We always outline numerous ranking factors that companies need to excel at. In the case of DNA testing kits, there is a highly specific set of criteria that guides our ranking process. Firstly and most importantly, we focus on the variety, quality, and accuracy of the tests available. These criteria are accompanied by 2 sub-criteria, including the number of genetic markers checked and the likelihood of test errors and failures. Another criterion that decidedly influences the quality of the test results is the competency of the staff. Apart from the overall quality of the report, we take into account the availability of health-related information. Further, we focus on the average turnaround time and the quality of customer support, two important factors that shape customer experience. We also determine whether the companies take adequate privacy measures and whether they have set prices that correspond to the quality of their services. Our final factor is how much effort a certain company puts in when it comes to scientific research and charity work. Every DNA testing provider on our list is involved with numerous projects with the aim of pushing the boundaries of genetic science to the next level. They also contribute to many charity organizations and funds. Here are the best DNA testing kits currently available. When looking for the best DNA tests to fit your budget, your personal goals, and the overall scope of your genetic exploration, researching all the available options is of paramount importance. Whether you are just interested in satisfying your curiosity or embarking on a serious DNA-related quest, the following mini-reviews will familiarize you with the top at-home testing solutions currently on the market. MyHeritage was launched 14 years ago in Israel by Gilad Japhet, a successful entrepreneur and passionate family historian. The company originally started out as a genealogical search database with billions of old records, documents, newspapers, photos, and other valuable insights into our past. It later complemented its genealogical efforts with genetic research and provided its customers with a high-quality ancestry DNA test. The company conducts business according to the direct-to-customer testing model, which means you can basically do your genetic screening from the comfort of your home. After you place your order, you will receive the testing kit used to collect and store your DNA sample. MyHeritage database contains around 2.6 DNA profiles and more than 40 million family trees created by its users. Up to this point, the company has tested more than 91 million individuals and helped them unlock the secrets of their past through DNA and get in touch with unknown relatives. The test costs 99$ (with frequent discounts) and offers detailed ethnic percentages based on the exploration of 42 ethnicities. Your sample will be processed in Family Tree DNA’s laboratory, known for its top-of-the-line technology and numerous certifications. The process checks 690,000 DNA markers in your genome, which ensures perfect accuracy. Once you receive your results, you can browse through the available subscription plans if you’re interested in complementing your genetic findings with genealogical sources. Subscriptions also allow you to create your own family tree and use some of the exclusive MyHeritage ancestry tools. You can test the service with a free plan, which is limited to 250 individuals in your family tree and 500 MB of storage. AncestryDNA is an integral part of the largest company in the world dedicated to genealogical research. We are, of course, talking about Ancestry.com LLC, a privately held conglomerate located in Lehi, Utah, founded back in 1983. The company complements ancestry DNA testing with genealogical records, stories, and documents. Apart from AncestryDNA, Ancestry.com also owns AncestryHealth, Archives.com, Find a Grave, Family Tree Maker, Rootsweb, and other brands. In the last three years, the company provided its users with more than 16 billion historical records. The Ancestry Magazine had more than 2 million subscribers. Its users generated more than 100 million family trees using 200+ million scanned photographs, written stories, and documents. AncestryDNA offers a single test named “Ancestry DNA Test.” The test, however, covers your entire genome, which means that both autosomal and gender chromosomes will be tested. 700,000+ genetic markers are checked during the procedure, ensuring 100% accurate final reports. Your results will also feature some AncestryDNA exclusives in order to paint a better picture of your family’s history, including DNA matches (your DNA is compared with other genetic signature in the company’s database), an ethnicity map (an interactive way of visualizing and interacting with your results), DNA Circles (allows you and your relatives to cluster around a common ancestor), and “Map and Locations” map (Ancestry Magazine exclusive, this map indicates the birth locations of your direct ancestors). Your raw DNA data file will also be available for download. The results usually take around 6-8 weeks to complete, depending on the demand at any given moment. Once your report is generated, a link to the results will be sent to your email. With big-name investors such as Google, Genentech, New Enterprise Associates, and others, 23andMe made quite the splash in the DNA testing industry with its high-quality testing solution, health report add-on, and precise report. 23andMe Ancestry Service DNA Test identifies your ancestry by matching your DNA signature with those of known genetic populations throughout history. You will receive information about the region where your DNA originated and ancestry timelines that will allow you to further explore the origins of your genetic material. The final report will also determine your haplogroups, which should identify the first ever human to bear your DNA – you first prehistoric relative, if you will, and the originator of your genetic line. 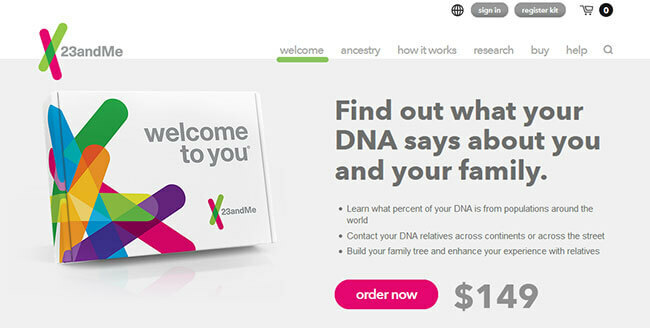 Finally, you will receive the percentage of DNA left from your Neanderthal ancestors. The test explores 31 sample populations and covers 150 regions of the world in its final test report. The price of the test is 99$. 23andMe is the only ancestry DNA testing company that offers health reports in addition to its ancestry results. The health report, if you opt for one, covers 8+ genetic health risks, 41+ health conditions, 19+ personality traits, and 7+ wellness traits for an additional $100. The main goal of this testing instance is establishing whether your genes carry any potential for hereditary diseases or not. Wisdom Panel is a well-known brand in the world of dog DNA testing. It is an integral part of Mars Veterinary Division, which was introduced back in 2005 after receiving a license for its Breed Determination Test by the Fred Hutchinson Cancer Research Center. The company has recently changed its name to Wisdom Health. It has tested more than 850,000 dogs, which makes it one of the world’s leaders in the field of canine genetics. Its comprehensive database of dog breeds paired with a sophisticated screening algorithm and strategically placed genetic markers ensures optimal test reliability and accuracy. The company simplified its testing procedure as much as possible in order to bring it closer to the general public. It follows the direct-to-customer testing model, which means you won’t have to expose your pet to strangers or traumatic experiences in unfamiliar settings. You can gather the relevant testing sample (buccal swab) in the comfort of your own home where your dog feels the safest. Depending on the test you choose, the turnaround time can be up to 3 weeks. The price of Wisdom Panel 4.0 dog DNA testing kit starts at 84.99$ and the company will replace it free of charge if it gets damaged during transport. Wisdom Panel Health, on the other hand, costs 149.99$ and adds screening for 150+ genetic diseases on top of breed identification. Wisdom Panel is a veteran in the field with around 2 decades of experience if we count its contribution to the Canine Genomics Project. All the samples are processed in a very modern, hi-tech facility by a team of experienced professionals. The Breed Determination Test will compare your dog’s DNA signature against 250+ dog breeds and more than 12,000 samples held in the company’s database. Apart from specializing in top-quality canine DNA tests, Wisdom Panel frequently takes part in relevant research projects designed to provide us with a better understanding of man’s best friend. Founded in 2016, Living DNA operates under the maxim “Find out where you really came from.” The company was launched by DNA Worldwide Group once it realized it needed to focus on its genetic ancestry testing service. The parent company was founded in 2004 and has collaborated with Family Tree DNA, Scotland’s DNA, and the team behind “The British Isle Study” of 2015. It is also partnered with hundreds of genetic experts, academic researchers, and scientists. With 650,000 genetic markers checked, Living DNA provides one of the most accurate ancestry testing solutions on the market. Additionally, every marker is tested 15 times to eliminate any possibility of error or test failure. Living DNA ancestry test is autosomal, which means it explores 22 pairs of your chromosomes, omitting the gender-related 23rd pair. This also means that you will not receive specific results regarding your maternal and paternal ancestral lines. However, it is important to keep in mind that your autosomal chromosomes are the richest depositories of information regarding your ancestral origins. The final report is generated within 10-12 weeks of receiving your DNA sample. Living DNA test results cover 80 different world regions with 21 located in the British Isles, making it an ideal option for individuals expecting heavy British descend. The company also allows for raw data download, which you can use with other DNA testing companies and various online services for additional ancestry exploration. Embark was born out of a pure commitment to dogs and passion for discovering the secrets of their genetic composition. In 2015, two respected scientists and genetic researchers, Adam and Ryan Boyko, launched what turned out to be a very successful new startup designed to decipher dogs’ DNA signatures and tell their owners, breeders, and veterinarians more about their furry friends. The main test for breed identification analyzes more than 256 quadrillion genetic combinations and provides an accurate picture of any dog’s genetic makeup. DNA samples are processed in a highly modern laboratory and the company also allows raw data download. Embark’s partners include the Cornell University of Veterinary Medicine and Scientific Advisory Board. The company also takes part in various research and charity projects and gives a part of its earnings to several animal shelters it cooperates with. Embark Dog DNA Test is the focal point of the company’s portfolio, featuring a price tag of 199$. The results will identify the breed of your dog and offer detailed ancestry information, comparing its DNA signature against more than 250 dog breeds, including wolf, coyote, and village dog. The results also include a health report, determining the risk for more than 165 genetic dog diseases and calculating your pet’s genetic age. You will additionally receive comprehensive care/wellness recommendations for your dog based on its genetic age and more than 200,000 DNA markers examined. Embark’s breeder test costs 179$ and the results will teach you how to breed your particular litter for specific coat features and size. Veterinarians can also partner with Embark and sell its testing solutions in their clinics. TeloYears is a genetic test designed to calculate your cellular age by determining your genetic age. The secret to a longer and healthier life is locked deep in your DNA – and with this test, you can discover how well you are aging. Apart from telling you your exact genetic age, TeloYears should also motivate you to grow and make changes in all fields of personal wellness. TeloYears was launched by Telomere Diagnostics Inc, which was founded in 2010. The company’s core team is comprised of four scientists, including Dr. Elizabeth Blackburn, the winner of the 2009 Nobel Prize in Medicine for her pioneering work in the field of telomere biology. TeloYears test begins with a drop or two of your blood collected from your finger in the privacy of your own home. Once the lab receives your sample, the technicians will extract DNA from your cells and analyze your average telomere length. The report will indicate your “cellular age” at the moment of testing and compare it with the nation’s average for individuals of your gender and age. The results can fall under the expected, better or improvable category. You will also receive personal guidance from a professional TeloCoach to determine optimal lifestyle improvements based on the latest achievements in telomere science, which can enable you to significantly elevate your health and well-being. GPS Origins is a modern ancestry DNA test created by Dr. Eran Elhaik and developed by DDC. Dr. Elhaik is the multidisciplinary team leader at the University of Sheffield and research associate at the Johns Hopkins School of Public Health. DDC, on the other hand, is a world-renowned company known for its hi-tech processing facilities with incorporated robotic sequencing technology. The conglomerate was founded in 1995, which gives it a long tradition of turning scientific marvels into widely available services. The main advantage of the GPS Origins test is its ability to take you back up to 1,000 years in the past and pinpoint to the exact town or village where your DNA signature originated. The test checks 800k genetic markers, providing extraordinary accuracy. Furthermore, it covers 41 world regions and takes 1,000 reference populations into account. The price of the test is 199$. DDC also allows you to transfer your raw data from other companies (Family Tree DNA, 23andMe, National Geographic, and AncestryDNA) for 39$. Apart from the main test, you can also order more specialized versions of GPS ancestry screening, including special editions of the test dedicated to individuals of African and Asian descent. The tests are able to provide you with detailed African and Asian ethnicity by utilizing a sophisticated algorithm that takes into account 11 and 17 relevant gene pools, respectively. Both tests explore your main ethnic origins and family lines up to 2,000 years in the past. Futura Genetics was founded in 2014 in Vancouver as a DNA testing company dedicated to maintaining a proactive lifestyle. The main idea behind the company was to familiarize the general public with the complex phenomenon that is genetic testing and keep the service as budget-friendly as possible. The company has developed a very reliable and accurate testing method and a comprehensive at-home testing kit to match, proving that DNA testing isn’t just reserved for wealthy individuals and corporate giants. Futura Genetics screens for a wide spectrum of diseases and conditions, ranging from annoying and embarrassing to dangerous and life-threatening. Futura Genetics DNA test costs 339 EUR (around 400$) and the final report determines your genetic predispositions for 28 genetic illnesses. Some of the included conditions are lung cancer, melanoma, Alzheimer’s disease, lupus, migraine, multiple sclerosis, prostate and breast cancer, alopecia, diabetes (type 1 and 2), and others. The test kit contains equipment for saliva collection and the procedure only takes around 2-5 minutes. The final results are usually generated 4 weeks after your DNA sample arrives at the processing facility. The kit is shipped worldwide without any additional shipping charges. The company pays great attention to the privacy of its users and the overall security of their personal information. Your data is stored in the EEE and only handled by the company staff. SSL encryption technology is also implemented in order to protect your communication with the official website. JScreen is a nonprofit organization partnered with Emory University and focused on screening for carriers of Jewish genetic diseases and conditions. It also tries to educate individuals with Jewish genetics heritage about the potential risks locked in their DNA. In 2014, JScreen was named one of the most innovative American Jewish organizations. The founders of JScreen are long-term Jewish community activists Randy and Caroline Gold. They decided to educate and test people for genetic diseases after their daughter Eden was diagnosed with Mucolipidosis Type IV (ML4), a very dangerous but preventable disease. Today, the couple also runs the ML4 Foundation, looking for a cure for their daughter. JScreen tests for 200 genetic diseases, 19 of which most commonly affect individuals with Jewish genetic heritage. Testing is also available to non-Jewish individuals. One of the biggest advantages of JScreen compared to other screening programs is that you don’t have to visit any community screening events or interact with anybody throughout the testing process. Eligible JScreen participants can collect their samples in their homes and simply mail them to the lab. Keep in mind, however, that JScreen will not allow you to place an order before contacting your physician and obtaining the necessary approval. Once your doctor gives their approval, the company will send you a testing kit and you can proceed with sample collection. JScreen is not a simple direct-to-customer testing company. It goes above and beyond to educate its customers prior to testing, give them professional input, and provide them with genetic counseling to explain the results. Our best DNA testing kits guide features the top companies offering ancestry, health, animal, and relationship DNA testing. The criteria we used while developing this list include the scope of the test, test processing times, privacy and security, value for money, and overall experience. The scope of the DNA test is important because you want to receive as much information as possible about your ancestry, health, pets or relationships. Test processing times are also significant because you do not want to wait for your results for too long, especially when it comes to relationship or health DNA tests. Privacy and security are among our criteria because you are giving your sensitive information to the DNA company of your choice and you do not want that data to fall into the wrong hands. Value for money matters because you do not want to pay a lot of money for a test that will not satisfy all your needs. Finally, overall experience focuses on all aspects of service, from the moment you order the test to the moment you receive your report. To find the best testing solution for your needs, you only need to determine the type of testing you want to perform and the kind of information you wish to receive. Once you set your expectations, our guide can point you in the right direction.